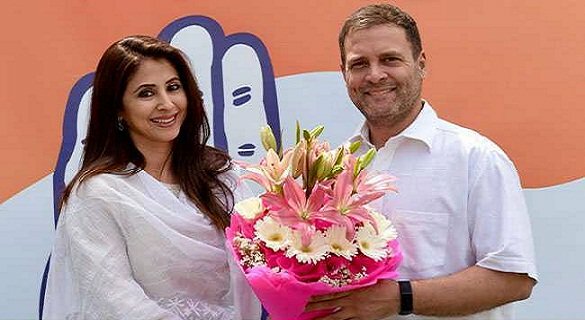 New Delhi: In a boost to the Congress ahead of the Lok Sabha elections, acclaimed actor Urmila Matondkar on Wednesday joined the Congress party. Urmila was indulcted in the Congress by AICC media incharge randeep Surjewala in the presence of party leader Sanjay nirupum and Murli Deora and party spokesperson Priyankqa Chaturvedi. According to party sources, Ms Matondkar, an established actor, may contest in Mumbai North as Congress candidate in the coming Lok Sabha elections.Earlier in the day she met the Congress president and Mr Gandhi welcomed her to the party. ''I welcome Urmila matondkar in the Congress party. Best wishes for her,''rahul said in a facebook post. Addressing the media after joining the Congress, Urmila said,'' I want to thank Rahul Gandhi for such a warm welcome. I am here because I believe in the ideology of Congress and what the party stands for. The actor said that she has not joined the party just for Lok Sabha elections. "Today is an important day because I am taking my first step in active politics. I am from a family that has shaped my political views based on the ideology of Mahatma Gandhi, Jawaharlal Nehru and Sardar Patel. It is another matter that despite being from an academics-oriented family, I joined films. But I had social awareness right from childhood. I have never done anything half-heatedly in my life, nor is this decision one of those and I want to say that I'm here to stay. Neither have I joined the party just for Lok Sabha Elections nor will I quit after the elections are over." the actress said.Addressing reporters, Mr Surjewala said the actor will contribute in spreading the Congress ideology and strengthening the party.